Giants Take Down Royals 5-0, Now Lead World Series 3-2 : The Two-Way In Game 5 of the World Series Madison Bumgarner pitched a four-hit shutout, taking San Francisco to an emphatic victory over Kansas City. San Francisco Giants pitcher Madison Bumgarner helped his team take Game 5 of the World Series against the Kansas City Royals on Sunday in San Francisco. To the delight of the home crowd at AT&T Park in San Francisco, the Giants' Madison Bumgarner pitched a shutout, allowing just four hits. "Smothered" was The Associated Press' verb of choice for how Bumgarner took down the Royals. 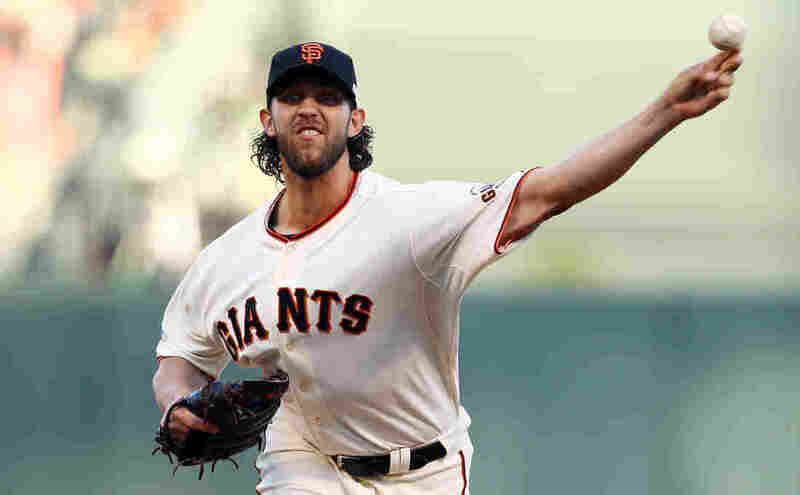 "Bumgarner struck out eight and walked none in improving to 4-0 in four World Series starts. He has allowed one run in 31 Series innings, an astonishing 0.29 ERA. "Brandon Crawford drove in three runs and Juan Perez hit a two-run double for the Giants, seeking to become only the second NL team to win three titles in a five-year span. "James Shields lost to Bumgarner for the second time, allowing eight hits and two runs in six innings." As the game was happening, the baseball world received some somber news; it was announced that Oscar Taveras, a 22-year-old St. Louis Cardinals outfielder, died in a car accident in the Dominican Republic. Taveras and his girlfriend were both killed in the accident, which happened near his home. Game 6 starts at 8 p.m. ET on Tuesday, back in Kansas City; it's being televised by Fox. MLB.com has a full schedule of games. In case you missed it, Robin Williams' children threw the first pitch of Sunday's game in honor of their father, who died in August.